Eating is easy, right? 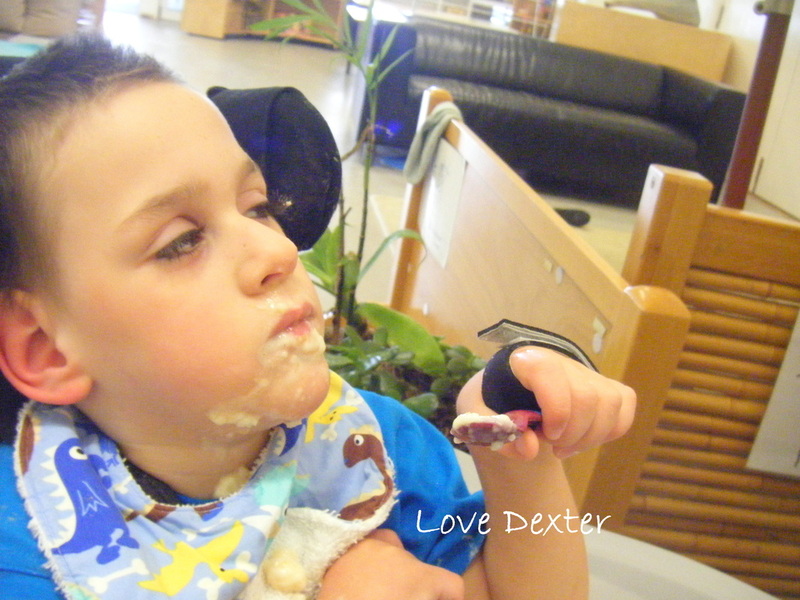 Actually, or people with cerebral palsy, eating is not always easy. For the first couple of months of my life, I was fed through a small tube. For a while there, my doctors and nurses were preparing Mum and Dad to take me home with this feeding tube. But one day, a nurse noticed me sucking on a dummy. Mum was really hoping we would be able to try sucking feeds (breast feeding) and eventually, they let us! I came home, after 122 days in hospital, drinking Mum's milk... and, not from a bottle. When I was ready, Mum introduced me to solid foods. She pureed my food and I enjoyed eating it. She started mashing it, and I learned to eat that, too! I was getting better at eating and then, the chemotherapy started. My throat developed sores and I had a lot of trouble swallowing, so this was a big set-back for my eating development. Everything went back to being pureed, and I ate a lot of sweeter foods. I never had to resort to a feeding tube, though, and that was something we were very proud of. I did develop an egg allergy, which is a typical reaction to the chemotherapy. If there was a trace of egg in the food, I would vomit everything up. That really limited the foods I was able to eat. Luckily, I outgrew that allergy, after about a year. At three, I love my food. I do have to learn to bite and chew my food (but I sure know how to bite Mum and Dad's fingers!) My speech therapist suggested I try to eat cheese and bacon balls, because they crunch when I chew them. Now, I can bite things... it just takes a bit of time. Some days, I do better than others. At three, I've started really wanting to try to feed myself. It's tricky, with so many things to remember. At three, some days, I am too tired, and I'm happy to be fed. Other days, I will refuse to eat, unless I can try to feed myself. Luckily, my preschool teachers have lots of patience, and let me feed myself. Dexter is on high calorie diet. His cerebral palsy means he uses a higher than typical number of calories, each day. He has also lost weight following his hip surgeries, and his chemotherapy also caused weight loss. He has teeth, but he does grind them and they have been broken down. He is able to swallow, and moves food around in his mouth. He can bite. Dexter mostly eats mushed foods. For morning and afternoon teas, he might have a soft K-Time bar, broken into small pieces. He enjoys fruit. Soft, cream-centred biscuits broken up into mashed banana, or fruit puree, is an easy meal. He enjoys fruit, especially mango and watermelon. For dinner, Dexter eats spaghetti bolognaise, with lots of vegetables and cheese. He eats quiche (now his chemotherapy-induced egg allergy has been out-grown). Often, Dexter eats a mix of beans, vegetables and cheese. He enjoys flavoured rice. He's not overly keen on green vegetables, and often spits them out! Dexter isn't good with dairy products, and they can bring on his reflux. 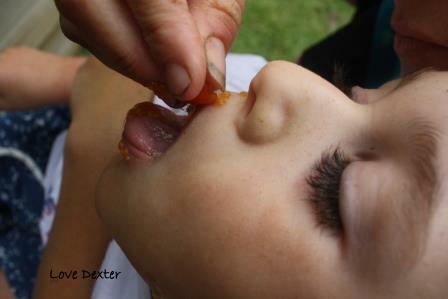 Dexter enjoys trying new things, though often, he will spit the first spoon of food out. He likes to know what it is he is eating. With patience, he soon decides whether he likes the new food, and if he does, will eat it. He enjoys biting hot chips, twisties and chocolate. He enjoys biting a fresh cherry tomato, and having the seeds burst in his mouth. Dexter eats most things... they just need to be broken into small pieces, or mashed a little. It takes a long time for Dexter to finish a meal, especially when he tries to feed himself. Dexter needs to be encouraged to drink. He has thickener added to all of his liquids. He can be fussy, and the drink he enjoys today, might be refused tomorrow. He prefers juices, from a range of fruits, as water can be too thin for him. Close monitoring of his drinks is important, as Dexter has had bowel issues in the past. He has been helicoptered to Sydney, as a result of these problems.